The Blackstone portable gas grill with griddle kit and carry bag/cover is everything you want in a small gas grill, with 260 square inches of grilling area. The 15.25 inch x 17 inch griddle is big enough to cook four 6 inch pancakes or ten or twelve 4 inch pancakes. That’s a lot for a portable grill, but the 12,000 BTU output is what’s really amazing for a portable grill with a one-pound disposable gas can. You’re going to love the easy setup for tailgate parties, hunting trips, or just about any outdoor party or road trip. Just pull into the camping area, pull out the Blackstone, and have dinner started in minutes. Or, breakfast… with pancakes! Your family will love you for it. Blackstone thought of everything with the Griddle kit and carry bag, the cover is water-resistant and fits snugly over the grill to prevent the wind from blowing rain up under the Blackstone. The carry bag and cover makes it convenient to take this portable grill to the park, sporting events, and camping. No more lugging around that big kettle charcoal cooker. Just grab the Blackstone and a can or two of propane gas and you’re ready for whatever your day entails. What’s more, the heavy-duty polyester and High-Impact (HI) Resin handles are very durable. 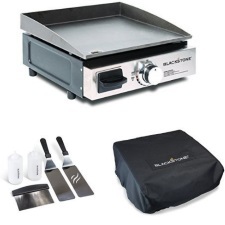 Click Here for the Blackstone Signature 17 Inch Table Top Griddle Carry Bag & Cover. With the Blackstone portable gas grill with griddle kit, you have 260 square inches of grill space and 12,000 BTUs of heat output. This portable grill is easy to setup, cleanup, and tear down so you can spend time enjoying your event or the outdoors. We found 900+ customer reviews on Amazon (verified buyers) with an average rating of 4.7 stars out of a possible 5 stars. Out of the 900+ customer reviews, 95 percent rated the Blackstone Table Top Grill either 4 or 5 stars. A few said they had a problem with the griddle warping and the Amazon CS representative offered to replace those defective units. One reply stated that you must season it with peanut or flax oil as it states in the instructions, and do not use max heat right away to keep it from warping. In summary, with all that you get for the money, this is a great buy for someone looking for a portable gas grill and griddle, with all the added freebies, such as the 5-piece tool kit, cookbook, carrying bag, and cover. You just can’t go wrong at this price.